The 24-Hour Mommy: Get your Mom 24/7 Planner at the Mommy Mundo Bazaar 2011! Get your Mom 24/7 Planner at the Mommy Mundo Bazaar 2011! Moms are always busy bodies. In fact, moms are always on-call 24/7. One tool that helps me with my job as a mommy is my planner. Here, I keep my personal To-Do List and my editing and publishing schedule. I also keep track of my boys' schedules because, oftentimes, I would need to accompany one or both to an event/appointment. I even color-code my entries -- green for work-related tasks, red for the boys, black for my personal tasks, and orange for blog-related events. For this same reason, Mommy Mundo introduces the Mom 24/7 Planner. The Mom 24/7 Planner is the first-ever planner designed for moms like us! It's a 6"x8" hardbound, sprial-bound planner that includes special planning pages that can help us manage ours and our kids' schedules, as well. Two things I particularly like about this planner are the grocery list and menu planner pages. Aside from these, there are health record page for our kids, record pages for our househelpers, an expense tracker, goal planning pages, idea pages, and a menstrual tracker. Best of all, there are discount coupons from Mommy Mundo partners. You can get your Mom 24/7 Planner at the Mommy Mundo Bazaar 2011 happening on November 19 to 20, 2011 at the Rockwell Tent in Makati City. Get it for only Php 300 (instead of Php 350) and you also get a Mommy Mundo Passport (worth Php 75) and free entrance to the Mommy Mundo Bazaar (worth Php 30). This only means you get more than 30% discount! 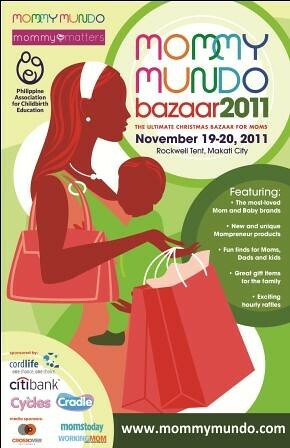 No time to visit the Mommy Mundo Bazaar 2011 this weekend? Please visit the Mommy Mundo site to know how you can purchase the Mom 24/7 Planner after November 20.